Sebastian Currier’s completion of the Second Symphony by Stephen Albert makes one regret the composer’s early passing, aged 51, in 1992. No symphonic tradition has coalesced into a recognisable signature so quickly or securely as that of America in the last century, as evidenced by the trio of such works here. 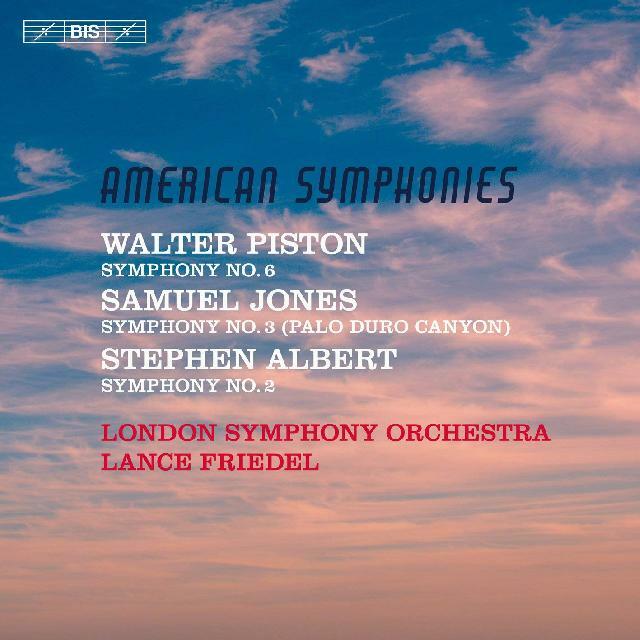 Under Lance Friedel, the London Symphony Orchestra play as if to the manner born, relishing the big-boned, ruminative opening of Walter Piston’s Sixth Symphony (1955), surfing the nimble jauntiness of its scherzo with balletic aplomb, finding plangent poetry in the exquisite Adagio and revelling in its thrillingly energetic finale. Inspired by the Palo Duro Canyon in Texas, Samuel Jones’s spirited, impressionist-leaning, single-movement Third Symphony (1992) is a work of crafted chiaroscuro contrasts with glowing atmospheres, bewitching melodies and almost tangible textures. Sebastian Currier’s completion of the Second Symphony by Stephen Albert makes one regret the composer’s early passing, aged 51, in 1992. Although its lyrical finale owes much to Copland, it’s a robust, engaging work of considerable originality. Superbly engineered sound (in the accommodating acoustic of London’s Henry Wood Hall) and good notes by Friedel.